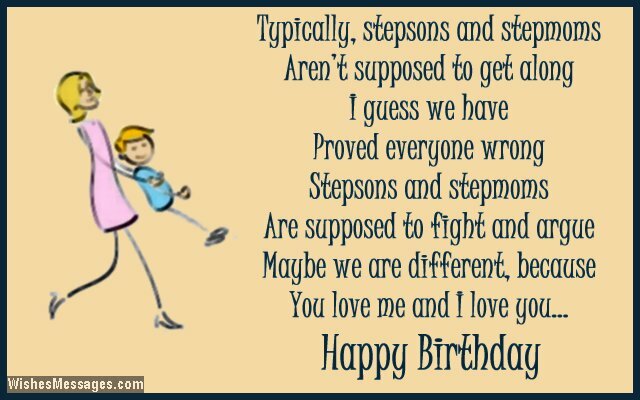 Birthday Wishes for Stepson: The relationship between a stepparent and a stepson isn’t always perfect. All the negativity associated with a bitter separation can claw into the happiness of the new family. Most stepmoms and stepdads may have experienced bad vibes from their stepchildren when they first made their presence felt. 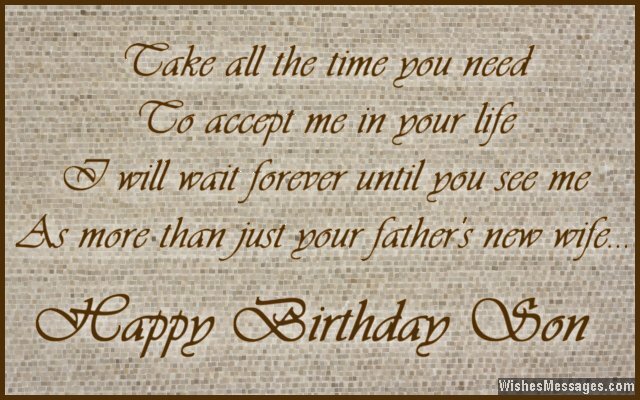 If you want to break the ice with your stepson, his birthday is a nice moment to write how you feel in a sweet message on a card. Be honest and share your feelings in your cute greeting. Don’t expect a miraculous flip in your relationship with him but little things like these will help you mellow down the perceived animosity. Building a strong bond with your stepson is a slow process – lots of love and undying patience is the only way to build bridges. 1) Take all the time you need to accept me in your life, I will wait forever until you see me as more than just your father’s new wife. Happy birthday. 2) I love you not just because you are a part of my husband’s life, but also because you are a part of my heart. Happy birthday. 3) You are the kind of stepson that all fathers would want their real sons to be like. Happy birthday. 4) Nature may not have wanted you to have my eyes, skin or looks. But destiny wanted you to have my love, respect and affection forever. Happy birthday son. 5) I will never try to replace your father, only the vacuum that his death created in your heart. I will never try to substitute him, only the happiness he brought in your life. I will never try to stand-in for him, but only the way he loved you so much. Happy birthday. 6) I don’t care about not having a biological or genetic connection as long as I have a beautiful emotional connection with you. Happy birthday son. 7) A son like you, gives my life those lovely hues. Happy birthday. 8) In the staircase of my life, you have been my most beautiful STEP. Happy birthday son. 9) I haven’t rocked you in a cradle or swung you in my arms when you were little. But you have rocked and swung around my whole life for the better. Happy birthday. 10) Blood is not the only thing which is thicker than water. The love of a stepmom like me for a stepson like you is too. Happy birthday. 11) Maybe I came into the family as an outsider, but you treated me like an insider. Maybe I am not your real mom, but any sign of hatred you have never shown. Maybe destiny brought me to you for a reason, because you are nothing less than the world’s best son. Happy birthday. 12) I have no idea what it feels like to have a step son – because you are no less than my own blood. Happy birthday sonny. 13) Happy birthday – to my best friend and buddy who is now my son. 14) We have broken every rule, passed every challenge and debunked myth which stated that stepdads and stepsons can’t get along. Happy birthday. 15) Typically, stepsons and stepmoms aren’t supposed to get along. I guess we have proved everyone wrong. Stepsons and stepmoms are supposed to fight and argue. Maybe we are different, because you love me and I love you. Happy birthday. 16) My life has been full of good steps that I have taken to achieve success and find happiness, one of them being finding a wife like your mother and getting a son like you. Happy birthday. 17) Your mom may be the link between us two, but there’s no hiding the fact that I get along better with you. Happy birthday son. 18) I have not been fortunate enough to give you the gift of life. But I have been lucky enough to give myself the gift of living life with a wonderful second son like you. Happy birthday. 19) You never treated me like you enemy, not even once. Thank you for giving our relationship time and much needed patience. I love you, happy birthday son. 20) Happy birthday to the stepson whose love and affection puts real sons to shame. I love you. 21) You have not grown up in my hands or cuddled with me as a toddler, but you have grown in my heart and cuddled my soul. Happy birthday to my wonderful stepson. 22) Being a stepmother is like treading on fire, but you made it a walk in the garden for me. Happy birthday. 23) Apart from a diamond ring, the most beautiful gift your father gave me as a wedding gift was a stepson as lovable you. Happy birthday. 24) If my marriage to your mother can be described as a sweet cake, you would be the cherry on top. Happy birthday son. 25) Babies are tied to their mothers with an umbilical cord. But we have been tied together by a cord of respect, love and affection. Happy birthday son. 26) STEP stands for Sensible, Tremendous, Extraordinary and Perfect – a crisp summary of our relationship. Happy birthday. 27) Only lucky women like me get a wonderful son like you without going through nine strenuous months of pregnancy. Happy birthday. 28) If all stepmothers had loving stepsons like you, no one would hate being called a stepmother. Happy birthday. 29) One of the best things about marrying your mom has been getting an amazing stepson like you. Happy birthday. 30) You have inherited all your father’s good qualities. Maybe that is that is the reason I have fallen in love with you too. Happy birthday. 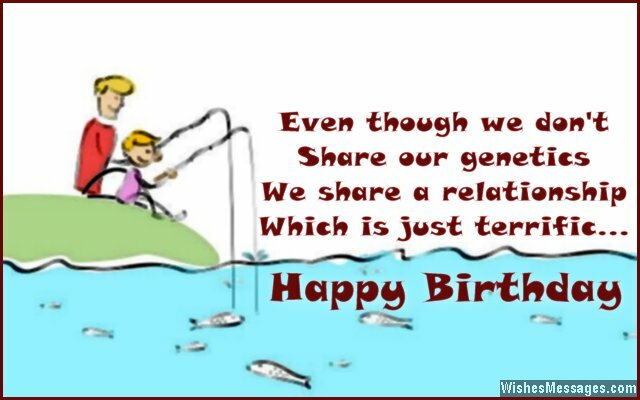 31) Even though we don’t share our genetics, we share a relationship which is just terrific. Happy birthday. 32) If a long and beautiful journey begins with a single step, the journey of my married life has begun with a beautiful one – gaining a stepson like you. Happy birthday. 33) For the rest of the world we are stepmom and stepson, but in reality we are a team which gets your dad do everything we want. Happy birthday. 34) The day I came into the family, the warmth of your welcome in your eyes I could see. I feel that being your mom was the best thing that ever happened to me. Happy birthday. 35) I have no clue on how to be a stepdad, because you never made me feel like one. Happy birthday son.